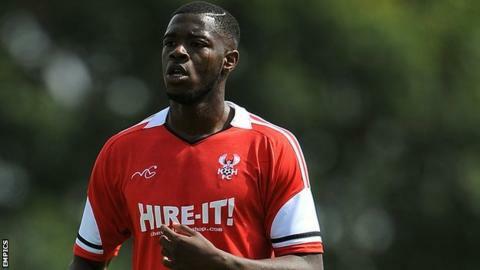 Nathan Blissett scored his second in three games for Bristol Rovers as the promotion-chasing Pirates beat Welling. The home side took the lead in the second half through new loan signing Blissett, who dinked the ball over Welling goalkeeper Benjamin Buchel. The visitors were reduced to 10 men on the hour mark when Jake Gallagher was shown red for a foul on Lee Mansell. Matty Taylor then secured the points for Rovers from the penalty spot after he was hacked down by Zac Fagan. The Pirates are now six matches unbeaten in the Conference. "It was a tough old game to be fair, Welling were disciplined and got nine men behind the ball at the majority of the time which was a little bit frustrating first half. "I said to the players it's just about being patient at times. We changed things around at half time just because I thought it was the right thing to do. "We went to a 3-4-1-2 just to try and get us a bit more impetus in the game and once we got the goal we went back to a 4-4-2 and that's the beauty of it, the flexibility of the squad. "We work on the systems and they can comfortably adapt to it. I thought it was important before the game to freshen things up a little bit." Match ends, Bristol Rovers 2, Welling United 0. Second Half ends, Bristol Rovers 2, Welling United 0. Foul by Lyle Della Verde (Bristol Rovers). Malachi Hudson (Welling United) is shown the yellow card for a bad foul. Substitution, Welling United. Ben Jefford replaces Joe Healy. Jamal Fyfield (Welling United) is shown the yellow card for dissent. Lyle Della Verde (Bristol Rovers) wins a free kick. Attempt saved. Angelo Balanta (Bristol Rovers) right footed shot from the centre of the box is saved. Attempt saved. Lee Mansell (Bristol Rovers) right footed shot from outside the box is saved. Substitution, Welling United. Malachi Hudson replaces Charlie Penny. Attempt missed. Lyle Della Verde (Bristol Rovers) left footed shot from the right side of the box misses to the left. Attempt saved. Nathan Blissett (Bristol Rovers) right footed shot from outside the box is saved. Attempt blocked. Stuart Sinclair (Bristol Rovers) right footed shot from outside the box is blocked. Substitution, Bristol Rovers. Lyle Della Verde replaces Matty Taylor. Goal! Bristol Rovers 2, Welling United 0. Matty Taylor (Bristol Rovers) converts the penalty with a right footed shot to the top left corner. Penalty conceded by Zac Fagan (Welling United) after a foul in the penalty area. Penalty Bristol Rovers. Matty Taylor draws a foul in the penalty area. Attempt blocked. Matty Taylor (Bristol Rovers) right footed shot from outside the box is blocked. Attempt saved. Matty Taylor (Bristol Rovers) left footed shot from the centre of the box is saved. Substitution, Welling United. Kieron St Aimie replaces Aristide Bassele. Jake Gallagher (Welling United) is shown the red card for a bad foul.